This customer knew their water heater was aging. They didn't want to risk the change of a leaking water heater causing damage in their home. This Madison family was proactive, ensuring hot water without interruption. Steam boilers have a life expectancy of at least 20 years, but once they are no longer effective it can create some cold homes. This Madison customer needed a replacement and Pipe Works Services was able to replace it with a more energy efficient model. Customer called us because he had water coming from around his water heater. Upon inspection we determind that secondary heat exchanger was cracked. The unit was 22 years old and not worth investing a lot of money into repairing. Mike C, our comfort specialist, went out to go over some options with the homeowner. Once he decided, Pipe Works went out and installed a new Lennox 2 stage gas fired furnace with a variable speed blower. A new humidifier was also installed. I'd like someone to check my furnace. We just turned it off and the on as it was not running. Looking for a boiler service/repair. Pilot light is on and gas seems to be flowing to boiler but it is not producing heat. Just tried putting it on this week for the first time this season. Would love to have someone out on Saturday, October 19th for a look at it and a full service repair. We have a small gas leak in our main pipe and are trying to rerun the 1 1/2 inch iron pipe from the meter so that is not hanging below the joists in the basement. If you believes the line can be reduced and wants to use CSST that is great. I have 3 Toto toilets at home. All 3 flappers are failing. I may need new valves in 2 or 3 of toilets. Attic Air Conditioning unit will not blow air. Would like an estimate for ductless air conditioner. This is just a short thank you note, for the fast and excellent service we received from your company the week of August 12, 2009. We are very happy with the result of all the work HVAC Installations and plumbing you performed for us in our home. Your associate Mike did a wonderful job. We wanted to say a quick thank you and tell you how much your support and professionalism were appreciated. We can't thank you enough for the expedient fix of our nasty sewer problem! PipeWorks will forever be our first call! On behalf of the Friends of Madison Public Library Touch a Truck Committee, I want to thank you for participating in our program with your plumbing, heating and cooling truck this past Saturday. On behalf of the Board of Directors, staff and volunteers of the Madison Area YMCA, I want to take the opportunity to thank you for supporting the 2012 Charity Bocce Invitational. Super happy with the work the guys did. Everything looks great. Ibn was one of the best service techs that I have ever had enter my house. He was friendly, knowledgable, and courteous. I will ask for him specifically the next time I need the services of Pipeworks! I take a bow to Francesca! True professional and she was very attentive to our scenario. A true Ambassador to Pipeworks! Ken was sent to my house to do a repair on a drain that overflowed. He arrived very quickly after I called and was able to easily identify and fix the issue. he recommended a company that could help with the water clean up and removal. He was professional and friendly and did a great job. My only hesitation with Pipeworks is that I have used them in the past and i find them to be very expensive (though the cost for today's issue was reasonable so I will likely use them again in the future). THe customer service rep that answered my initial call was very helpful as well and understanding that I needed to get someone out here right away which I appreciated very much. Our Technician, Jonathan, provided quality workmanship, outstanding advice on multiple problems, and all-around superior customer service. With very short-notice, Jon helped us through an emergency and worked seamlessly with the town's water department to get the job done the same day. PipeWorks has been my go-to plumber for the past several years because of their expertise, reliability and customer focus. Today Zack came to fix a leaky toilet…along with a few other issues I asked him to address. He took it all in stride, including the extra repairs that weren't "officially" scheduled. As he's done on past occasions, he resolved all the issues quickly and efficiently. He's terrific at explaining the problem and offering multiple solutions at different price points. With professionals like Zack, I know the work will be done right the first time and my house will be treated as if it were his own. Thanks, PipeWorks, for coming to the rescue again! Superb workers! They arrived just when they said they would. Jonathan explains what he's going to do and does it. The halls they walked through were left clean. They are great! Pipe Works arrived, gave professional estimate and Jimmy was so helpful and informative, we cancelled our other company estimate and went with Pipe Works on the spot to get our shower changed over. Pipe Works saved us a ton of money with our monthly heating bills. The staff was very knowledgeable. Our home is very old, they replaced much of the duct work to have our heating work more efficiently. What a pleasure to have someone arrive on time and nothing was a problem for Jonathan. Not only did he complete the work we needed, but also took care of a few extra's for us. I couldn't be more pleased with the customer service. Thank you Pipe Works! Pipe works is always very professional. I would highly recommend them. We had two toilet tanks refitted and a new set of sink harware installed. The work was done efficiently and our serviceman, Ken, worked hard and was always courteous. Nice work. Mario, my technician, was knowledgeable about the products (hot water heaters) that I was in the market for. He arrived on time, prepped the area, installed my new tank seamlessly with a smile on his face. Mario answered my questions, kept me updated on his progress and left my house cleaner than when he arrived. I would highly recommend Pipe Works, Mario and supervisor Kevin who was courteous and efficient when I spoke with him on the phone. Pipe Works goes the extra mile to make their customers happy. Rich was professional, friendly, knowledgeable and very helpful. He made credible suggestions based on what needed to get done versus what he needed to sell. Everyone who worked on our installation project provide excellent service. They we very good at what they did with the added bonus of being very nice people. Our crew consisted of Rob, Charlie, Nick and Giovanni. "PipeWorks was recommended by our contractor. I like..."
"Our Technician, Jonathan, provided quality workmanship,..."
"Great experience with Pipeworks. Had them over for..."
No matter whether your plumbing job is big or small, Pipe Works Services, Inc. is the contractor that will get the job done right the first time. Nobody wants to call a plumber because it means something is wrong with their home, but we can fix everything from leaky faucets to drain and sewer cleaning. Want new fixtures to remodel your home? We've got you covered there too with a wide range of beautiful options! We also specialize in electrical services, including repair, troubleshooting and maintenance of all electrical systems, interior and exterior electrical work, emergency services and much more. We can also install generators for your home so that you're never out of commission when the power goes down. Only professionals are truly equipped to handle electrical needs, and we are proud to offer these services! Pipe Works Services, Inc. is proud to serve our area because we put customer service first. Our team of knowledgeable staff and certified, trained technicians want to help find a solution that will work best for you so that you can enjoy excellent, long-lasting results. Call us today for a free estimate! Having trouble keeping your home at a comfortable temperature? Many problems with heating and cooling systems working more than they should can be solved with better insulation. However, there are times when it is merely the system itself that needs attention. When you need repairs done on your heating or cooling system, call the professionals at Pipe Works Services, Inc. to get the job done right the first time. By having your heating and cooling systems services regularly, you can avoid a crisis when you really need them. Small problems with your systems can turn into larger, more costly ones if left unchecked which is why it is so important to keep them in good shape. Give us a call today to get your systems serviced! At Pipe Works Services, Inc. we put customer service first and are proud to serve our area. Our team of trained technicians uses only high-quality materials from the best manufacturers in the business to ensure that you get only the best results. A major problem with homes today is that they suffer from inadequate insulation, thus allowing air to seep through cracks and gaps in floors or walls. Attics and crawl spaces can be the biggest problem areas because in many ways, they regulate the air that comes in and out of the house in what is known as the "stack effect." When air leaks out of the attic, cold air from the outside is brought up through the crawl space or basement, circulating the cold air through your home and making your heating system work overtime. 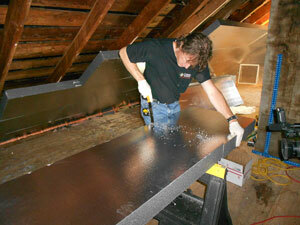 Our SuperAttic insulation system seals all cracks, cranies, and crevices that leak air. By installing the proper amount of insulation in your attic, you can better regulate the temperature of your home while saving money on your energy bills. For crawl spaces, we offer excellent vapor barriers that will keep good air in and seal moisture, bugs and cold air out. Need a reliable electrician for interior or exterior lighting, complete home addition wiring, or 24/7 electricity repairs? Pipe Works Services, Inc. is your trusted electrician of Madison, New Jersey, providing these services and much more! Is your electricity as energy efficient as can be? Schedule a free, no-obligation service estimate to find out today! This Chatham home's fixtures were experiencing premature wear due to the hardness in the water. The perfect solution was the Halo 5, which requires no salt and produces a bottled water taste. Another customer in search of better tasting water. This customer didn't like the taste of the water from the tap, and wanted something salt-free. Halo 5 solves the problem for this home. Open 1 ft section of the basement/bathroom drywall ceiling below the kitchen. -Spray Foam the rim joist with 2 inches of closed cell spray foam to air seal and insulate. -Patch all holes created with drywall and 1 coat of drywall joint compound. -Patch living ceiling hole left when radiator was repaired. Clean up and dispose of all debris in the crawlspace. -Install a Terrablock foam board insulation through out the entire crawlspace. -Install a 20 mil poly vapor barrier over the entire crawlspace floor. - Install 2 inch silver glo foam board insulation on all the exterior walls. -Spray foam all accessible rim joist with 2inch Closed Cell spray foam. - the right side up to where the roof meets the covering of the entrance. Pipe Works Services Inc. will also remove the vinyl soffit on the underside of the overhang above the garage entrance at the front of the house. Pipe Works Services Inc. will install foam insulation to air seal all accessible opening to the best of our ability, to prevent air infiltration. Pipe Works Services Inc. will re-install the removed sections of the vinyl soffit. Pipe Works Services Inc. will remove sections of the vinyl siding on the wall above the garage at the front of the house. We will drill 2-9/16" holes between the studs of the wall. Pipe Works Services Inc. will dense pack our TruSoft Cellulose Insulation through the drilled holes, filling the cavities of these spaces between the studs. Pipe Works Services Inc. will plug the drilled holes and seal air and water tight. Pipe Works Services Inc. will re-install the removed sections of the vinyl siding. Pipe Works Services, Inc. will drill 2-9/16" holes between the joists of the garage ceiling. Pipe Works Services Inc. will dense pack our TruSoft Cellulose Insulation through the drilled holes, filling the cavities between these bays. Pipe Works Services Inc. will plug the drilled holes and apply some joint compound to seal it air-tight. Please note that Pipe Works Services Inc. will not be responsible for painting or repainting, nor liable for the costs or any related charges. Remove and dispose of existing fiberglass and debris in crawl space. Supply and install CleanSpace Crawl encapsulation with 2'' Silverglo bolted and air sealed to side walls 1" TerraBlock insulation on floor covered with cleanspace vapor barrier liner. Reduce heat loss and infiltration of cold air by sealing and insulating the Rim Joist area with approximately 2" closed-cell polyurethane spray foam insulation. Upgrade 2'' x 4'' wall insulation with dense-packed TruSoft cellulose insulation by drilling through the shingle and sub-wall dense packing each joist bay with cellulose then plugging all holes with a cedar wood plug and sealing with foam or caulk. This includes all of the exterior walls on the first floor and the back and two side walls of the second floor. Shingles will not be replaced as new siding is being installed by others at no cost to Pipe Works Services. Insulate and air seal ceiling over garage with dense-pack TruSoft cellulose insulation - ceiling bays accessed from inside of the garage by drilling multiple 2 1/4" holes in the Sheetrock ceiling dense packing each joist bay with TruSoft cellulose then plug and patch all holes with one coat of Spackle. We will repair the sections of Sheetrock that have been cut out on the left side of the garage. Apply approximately 3" Closed cell spray foam to over hang of master bedroom and band joist associated with over hang. PIpe works Home Services installed the folloing in a home in Madison, New Jersey. Pipe Works Services received a call from an existing customer in Madison, NJ about a boiler tune up. This customer wanted to be proactive and wanted to prepare for the upcoming fall and winter months. Luckily Pablo was the right technician for the job. Pablo was dispatched and went to the customers house to perform a through inspection and cleaning. Pablo cleaned the burners for the boiler which is the central element that makes the heat, cleaned boiler sediment out, then tested auto feed which maintains a safe water line for the boiler. Pablo cleaned the flame rod where the flames reach the boiler and tested system for proper operations and function system is running properly. This boiler was installed by Pipe Works 2 years ago. Pipe Works Services received a call from a customer in Madison, NJ about their air conditioning not turning on. Pipe Works technician Zach arrived to home to diagnose the cause of AC not engaging. Zach found the overflow safety switch to be tripped. Dried off the switch and reset it. The unit engaged. Cleared out condensate drain line and tested it. There was a small obstruction in the line but since clearing it, water flowed normally. This is likely the cause I'd Raised up the overflow switch and put it back in the pan. Zach discovered that the coil pan was indeed cracked and leaking which is causing water to fill secondary pan. Our customer was provided estimate from Rob and our technicians Nick, Odin, Ramito and Ryan installed a 4 Ton XC16 Lennox Condensing Unit, CBX32MV Lennox Air Handler with a Lennox iComfort Thermostat. Hi, we just moved into this house and we would like to clean out our air ducts and dryer vent. We'd also like our AC unit looked at to see if it needs to be serviced or upgraded. Can someone come out on Friday to look and provide an estimate? Back flow into drain in basement. causing odor and drain flies. Need to repair a small leak in a water pipe in the basement. I have a family room with a crawl space below it. It has ceiling insulation under the floor but with the very cold temperatures cold air has been getting in near the fireplace and parts of the floor. Perhaps the spray insulation can be applied to the area where the floor meets the walls under the house.